A condominium project designed by Libeskind who was once the king of the un-build architect, completed last year, a condominium by Koolhaas is about to be completed, an office tower by Toyo Ito, condominiums by Hadid and　Nouvel, a mega complex by Foster are under construction. And another redevelopment project by Meier, broke ground just recently. The branded architects invited by the developers. It appears that the system of “branding” is functioning very well here. Above is just one illustration of the current construction and architecture boom in Singapore, whose economical growth is still predicted to be 2-3.5% in the year of 2013. (*1) In the mission statement of Singapore Institute of Architects (SIA) states their mission is “To champion excellence in architecture and the built environment” and our vision is to see “Singapore as an Architecture Capital”. At a glance this Capital of Architecture is in its full bloom. Rem Koolhaas said “It ( Singapore ) is conceived as the apotheosis of the tabula rasa” (*2) and described Singapore as a place which can keep its existence only by constant cycle of scrap and build. And now the reality is unfolding in this cycle. Another factor contributing to this architecturally prosperous situation, is the clever and effective maneuvering of the city planning by the government. The main player in the game is the Urban Redevelopment Authority, URA. It is the Singapore’s national land use planning and conservation authority. 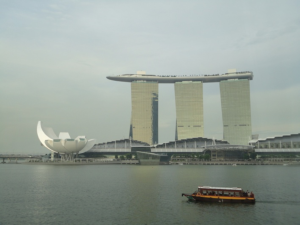 Its mission is stated as “to make Singapore a great city to live, work and play in”. While its role as the master planner, law maker and approval agency is getting to be important and prominent, URA also controls the sales of the public land and organizes tender process to see to it that the national asset be effectively utilized. 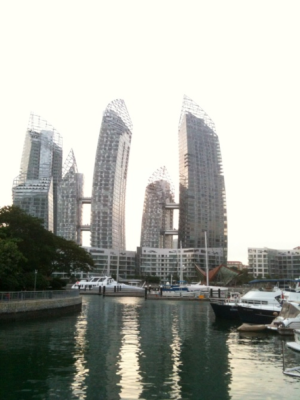 And it sometimes also act as a developer by itself, as such in the case of the Marina Bay area. While observing this architecture heaven like situation, one story caught my attention. It was an article in one of the local newspapers(*3). It was about the plan of the new terminal at Changi airport which is ranked highly as one of the best airports in the world, in recent years. The article said “that local firms would be excluded from a competition to design the new Terminal 4 at Changi Airport” In this apparently soaring condition in architecture I felt as if I was captured and dropped into an air pocket. It made me even think the current prosperity in architecture scene may not be the result of a deeper understanding of architecture. Furthermore it made me question if there is any current or force pushing the architecture culture to be more mature. It seems as if it is just because the big company and developers with money want products with famous “branded” architects’ name attached and just to create the buzz in town. After this incident, I could not stop thinking “what is Singaporean architecture?” I am now realizing that if someone asked me “what is Singaporean architecture?” I have no clear answer to it. The uniqueness of Singapore, for example, its tropical climate nor its multi-ethnicity nor whatever, seems have not been given the chance to become the driving force nor the lexicon of the recent architecture discourse. Many of recently completed buildings are cladded with floor to floor glass skins results in allowing more heat to come into the rooms and eventually lead to the need of adding aluminum louvers around the perimeter of the building. The lobby and the office interior space are practically frozen by the air-conditioning. I am not saying that the context is everything as the determining factor of the presence of a building but I felt a bit desolated. The founding father of Singapore, Lee Kuan Yew once stated “ Singapore is a very small place in a very, very large variable, changing world, and if it is not swift in making adjustments, it will perish and the people know that. (*4)” And directed and predicted the future of the country that it has to be in constant movement and evolution in order to strive. And the challenge is to find the way to nourish architecture as a culture in this ever-changing ever-losing context. The seeking of the Singapore original architecture is still many more miles to go. In order to provide service as an architect, you need to be approved by Board of Architects of MND. As an an architects’ organization, Singapore Institute of Architects, SIA(*5) is playing actively. Among the registered architects, AEDAS, Architects 61, CPG Consultants, DP Architects, Jurong Consultants, Ong and Ong, P&T Consultants, RSP Architects Planners and Engineers, and Surbana International are offices comprising of more than 100 staffs. Some of them were established initially by the people moved in from abroad. In the recent years, there are many offices getting involved in project in the developing countries such as India, Myanmar, Vietnam, by making the most of being located nearby. And usually the foreign talent work together with these larger local firms and hire them as project architect. And as for the structure and mechanical engineering firm, there are those international firms like Arup, Mienhardt to small local offices. As it is often said, Singapore with its small land and no natural resource, it is focusing on high quality human resources, both in producing and welcoming from abroad. And this is the same in the field of architecture. Just by going over the list of foreign architect involved in the project in Singapore, you will come across with the name of the modern masters which you had seed in the architecture history book(*6). Japanese architects had been on the map from relatively early time. General process is not much difference from that of in Japan. The approval process flows as above and submittal of drawings and information to the necessary authorities are required at each stage to obtain approval. The process is digitalized and submissions are done on web sites. BIM: Building Information Modeling are coming into the approval process. Various submission will be done under the name of Qualified Professional ( QP). This person is usually the architect in charge and / or certified structure / mechanical engineer assigned to the project. Please refer to the BCA’s home page below for more detail flow of the submission. Below are the main authorities to be dealt with during the process. I think this list itself will provide some good idea on the issues rises for the approval. Taking care of the city planning issues such as the use, GFA, building set back, height limit, cut and fill in the site, etc. Taking care of means of egress, safety measures, building materials, etc. Also looking after the Green Mark Scheme. Taking care of the fire safety and constructions of shelters. In Singapore, it is mandatory to place bomb shelter (household shelter) even in residential buildings. Taking care of water supply, sewerage and environmental issues. The BCA Green Mark Scheme was launched in January 2005 as an initiative to drive Singapore's construction industry towards more environment-friendly buildings. The standard covers broad aspects in building and construction; architecture planning, use of material, MEP appliances/ machine specs, building operation and maintenance method, construction methods as well as environmental control during the construction. The standards differ by its building types, by if it is new building or renovation, etc. In some cases it is linked to the building permit process and it is required to at least meet the minimum standard of the scheme in order to acquire the building approvals. Based on the eco features designed and planned, the project will be credited with points based on the standards. And it will be entitled to Platinum, Gold, Silver, Bronze and certified based on the accumulated points. These categories are often referred to as the marketing material and treated as good added value items for the developers. Interestingly there are some incentive programs such as extra GFA, incentive money etc. are linked to the scheme to promote the scheme. There are some “Green Mark Consultants” who specializes in helping the clients to acquire the certification. It is often the case that the project hire this consultant due to its cumbersome procedure and its cross specialist nature. Please refer to below web page of Green Mark Scheme for more detail. There are many contractors, from big to small, both Singapore local and the foreign available. Please refer to the below BCA web site which shows a list of contractors graded by BCA. The reputation of the superb quality of Japanese general contractors is high. And they are often asked by the local developers to participate in the tender for their large scale projects. But they often have to turn down the requests because of the too busy situation from the recent construction boom. Shop drawings for construction are rarely produced by the local contractors. And even the shop drawings were part of the tender condition, in one case we have ended up sending our own staff to site to teach how and what to draw in the drawings. Architects who have been taken care too well in Japan by the contractor may initially be at a loss. Contractors, beside Japanese ones, who have good reputation are WOH HUP (Singapore) and Dragages (France). The statistics shows the number of Building Permits granted is now back to the number as before the Leman Shock 2008 in all sectors. K .Tange, K. Kurokawa, F. Maki, T. Ito, M.Safdie, I.M. Pei, P.Rudolf, P. Johnson K. Roche, R. Meier, N. Foster, D. Libeskind, Z. Hadid, J. Nouvel, C. Ingenhoven, R. Rogers, SOM, KPF, NBBJ, etc.